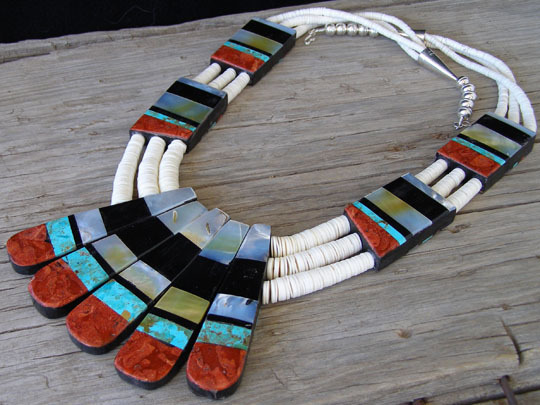 This large mosaic inlay necklace is wholly inlaid on both sides so that it can be worn showing either side. One side shows mosaic inlay work utilizing apple coral, jet, yellow & white mother of pearl and Kingman turquoise. The other side shows mosaic tiles of Kingman turquoise, jet, lapis lazuli, narrow bands of apple coral, as well as white and yellow mother of pearl. Both sides are stunning and you'll choose which way to wear it based upon your mood and wardrobe choice of the day. The five mosaic finger tabs at the center of the necklace and the block-like "shield" mosaic pieces running up the sides of the necklace are strung on a three-tier group of graduated white clam shell disk beads. The inlay work itself is built on a foundation of jet. This is a hefty, large necklace and probably not for those of small physical stature. For those who like large, imposing pieces of fine workmanship, this is just the thing. This is the Santo Domingo Pueblo equivalent of a large Navajo squash blossom necklace. The necklace is finished with Sterling beads and Sterling cones at the catch. In terms of the length, the measurement around the inside edge of the necklace (shortest length) is 28 inches. When measured around the tips of the mosaic inlay tabs, the measurement is 38 inches. Mosaic shields: 2 trapezoidal 2" x 1 1/4"; 2 rectangular 2" x 1 1/8"